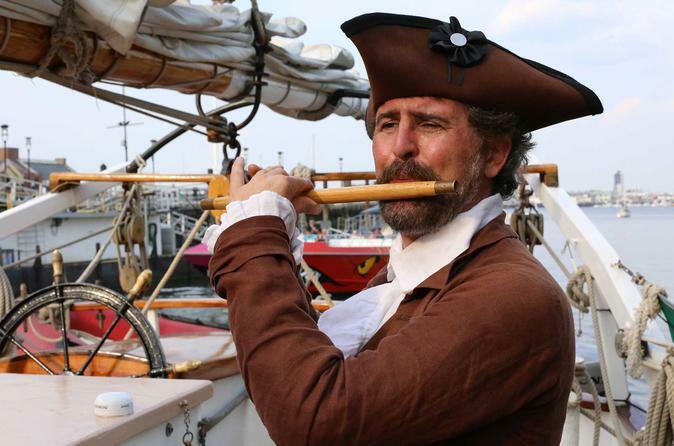 Join the Liberty Clipper on Saturday evenings for our "after hours" Rum and Revelry sail! You'll enjoy the sparkling lights of the Boston skyline while being regaled with traditional songs of the sea performed by professional actors on board our flagship schooner. Haul up the sails to a sea shanty and experience the sounds of times gone by as you sail on our grand schooner for this two hour get-away. Visit our bar to pick up our signature drink and the sailor's favorite - a Dark 'n' Stormy! - featuring Gosling's dark rum, ginger beer, and a twist of lime. You'll also have the chance to sample several other varieties of rum and port selections in a free rum tasting! You can find the Liberty Clipper by Central Wharf next to the New England Aquarium in Boston Harbor. • Fireworks right in Boston Harbor are scheduled for Saturday, June 30th - this is your chance for a front row seat! It will surely be a special Rum & Revelry Cruise. • Additional Rum & Revelry cruise dates added for the July 4th Independence Day Weekend (July 1 and July 3). Once all passengers are aboard at 8:30 pm, the Liberty Clipper will get underway. At this point you can sit back and relax with your special rum concoction or tease your taste buds with the free rum tasting option. Depending on the wind and weather, we might sail toward the outer harbor and you'll get a look at Fort Independence, watch planes taking off or landing right over our masts from Logan International Airport, and view the Boston Harbor Islands. Or we might head over by East Boston, visit the Charlestown Navy Yard - home to the USS Constitution, and glimpse the white steeple of Old North Church in one of Boston's oldest neighborhoods, the North End. The Rum & Revelry Cruise is two of hours of fun and you will be able to join in to sing shanties from long ago or just sit back and enjoy the view as the Liberty Clipper crew offers you the best view of Boston - from the water! It is totally up to you. Enjoy our bar's selection of rum offerings at sea: Gosling's Dark Rum, Pusser's Royal Navy Rum, Madeira Wine & Port. Please note that due to the aforementioned rum theme (hence the title Rum & Revelry! ), this activity is limited to the 21-and-over crowd. Also please keep in mind that as it can get breezy out on the water, passengers might want to bring a light sweater or jacket (some Liberty Fleet merchandise is usually available for sale onboard). And yes, there are bathrooms (called 'heads' on ships!) below deck!